Leichhardt Town Hall- 107 Norton St Leichhardt 2040 107 Norton Street, Leichhardt, NSW, Australia. A Combination of all talents in one Grand Show! Welcome to witness the impossible !!! The multi award-winning illusionist "Saksham" who has baffled people from the streets of Sydney to the large stages and festivals. 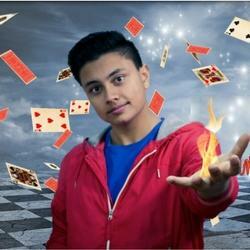 He may be only 15 yrs but is a master of magic and his spectacular illusions will always keep you wondering. He will be astounding you with his astonishing illusions combined with comedy and dance. Head judge KGT "You are born to do this" David Taylor "very charismatic" Hornsby advocate news "Saksham you owned the stage"